Optimus Healthcare Ltd established their retail brand, BIOHANCE, to give public access to research-based cosmeceutical products developed with the latest and proven findings in skin science. 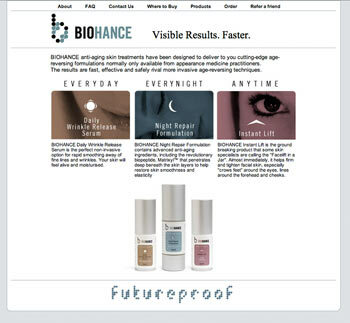 BIOHANCE anti-aging skin treatments have been designed to deliver to you cutting-edge age-reversing formulations normally only available from appearance medicine practitioners. The results are fast, effective and safely rival more invasive age-reversing techniques.